I wish I could lay claim to coming up with the title for this post, but I cannot. 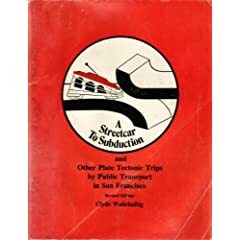 The title, officially Streetcar to Subduction and Other Plate Tectonic Trips by Public Transport in San Francisco, is from a wonderful paper by the late Clyde Wahrhaftig. Originally written for the AGU in 1979, the paper was updated in 1984. Wahrhaftig described six trips that one could take by public transport around San Francisco to see the area’s geology. The rare and expensive booklet (six copies were available on amazon.com from between $60 to $130) is a pleasure to read, not only for the geology but also for Wahrhaftig’s insights on history and architecture. The J Church line is the so designated Streetcar to Subduction. With a little effort you can see pillow basalt, sandy turbidites, and radiolarian chert, basically a microcosm of typical oceanic crust. You can learn about how two high school student broke into the supposedly impregnable New Mint Building, just weeks after it opened, and you can learn to identify and avoid poison oak. On another route Wahrhaftig gives an introduction to San Francisco architecture and on one more he reveals how residents saved their houses during the post-1906 earthquake fire by soaking cloth in wine and spreading the material on their roofs. He also shows where to see serpentine throughout the city. Born in Fresno, California in 1919, Wahrhaftig was an avid outdoor explorer and field geologist. He died in 1994; a thoughtful obituary is available on the UC Berkeley web site. He didn’t drive and often eschewed conventional means of travel. As someone devoted to making geology accessible to everyone, he put together his now legendary guides to San Francisco rocks. 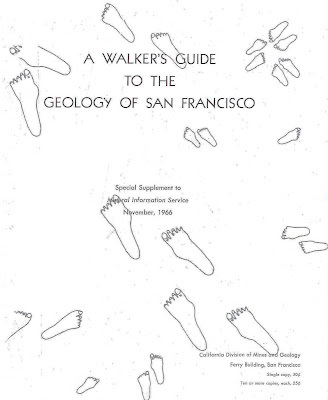 In addition to Streetcar, he also wrote A Walker’s Guide to the Geology of San Francisco, which does contain one walk that focuses specifically on the building stone of the city. You can get a new copy straight from the AGU for $11 if you are a member, $16 if you are not. Thanks. I meant to check to see if the booklet was available at AGU but spaced it out. Yes, there were several copies just lying there. This isn’t rare, it’s just that no one wants to sell their copy.